Scravings: She's a NW Gal! O.K., It's official. 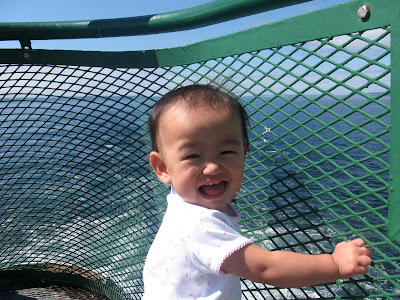 She's a Pacific Northwest gal now--she loves the ferry boats! .......by the afternoon, it was sunny and gorgeous! Maya had to have shots and blood drawn today, and she REALLY didn't like it! She worked herself into a serious frenzy during the blood draw and was kicking and sweating and I'm quite sure cussing in Chinese. 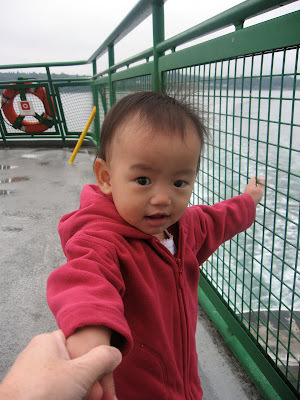 But, thankfully she's pretty forgiving and was being a ham on the ferry ride home. The pediatrician, who specializes in internationally adopted children, was amazed at Maya's health and development. 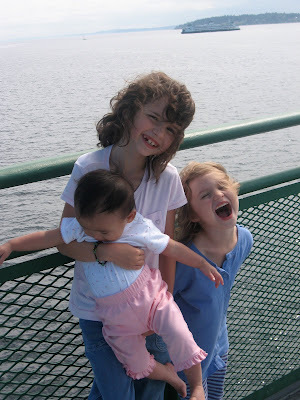 She feels strongly that Maya's brief time in foster care really did wonders in her life. On the form, under "development", the doctor wrote in all caps with an exclamation point, "NORMAL!" 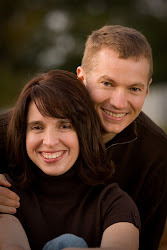 We feel so blessed and so grateful to the family in China who loved her. Abby thinks being a big sister is quite a hoot! The boys are off at scout camp until Friday night, so it's been fun with just the girls. Madeline is such a huge help. She is going to be a very in-demand babysitter in a couple of years--that is if I let her share her services with others! Another surprising thing at the appointment was that they said Maya's height is in the 50th percentile. 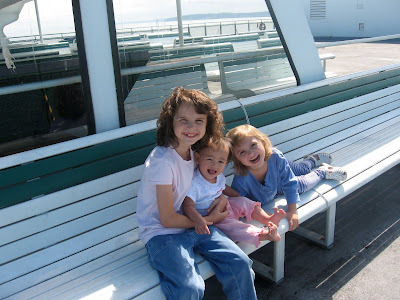 My three older kids are almost always in the 10th-25th percentile range. It seems funny that our tallest may be our China baby!